Cook pasta according to package directions. In a medium saucepan over medium heat, melt butter and add garlic. Cook until fragrant, about 30 seconds. Add cream cheese and stir until melted. Slowly stir in milk, then add sour cream, lemon juice, salt and red pepper flakes. 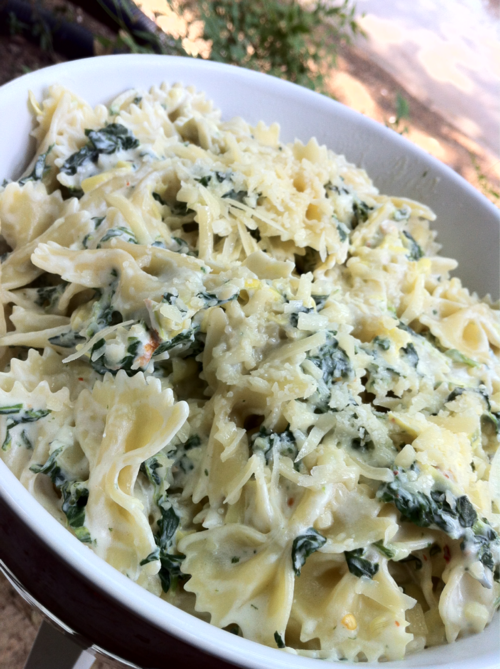 Stir in artichoke hearts, spinach, and parmesan cheese. Drain pasta and add to artichoke mix. Toss and season to taste with salt and additional lemon juice as needed. Serve with additional shredded Parmesan.